Sure squirrels look cute when they’re hanging out in a tree gnawing on an acorn. When they’re hanging on your porch screen with their nails creating holes, not so much. Squirrels may seem cute and harmless, but they can cause severe damage to your home and yard. Known for being agile and persistent, squirrels will find ways to gain access to your home. These unwanted house guests build nests, taking advantage of the warmth and safety your home provides for them. Critter Control of Dallas has experience with all squirrel-related situations. If you have tried different DIY methods to remove the squirrel(s) on your own and were unsuccessful, let Critter Control of Dallas assist you in removing them thoroughly and humanely. While waiting for help from a professional, consider the following to help avoid a destructive situation and to keep your family safe. 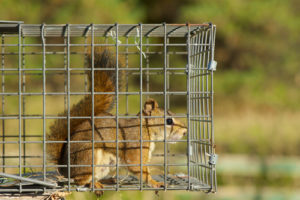 Catching a squirrel on your own, potentially putting yourself at risk to catch viruses and parasites if you are bitten. Due to possible diseases, cleaning up carcasses or droppings on your own can be dangerous. Leaving your home unprotected from future invasions. Hire professionals who have experience with humane professional baiting and trapping techniques. Take precautions and have your home properly inspected and sealed. If you are experiencing any issues with squirrels on your property or in your home, call Critter Control of Dallas at 817-222-1101 or visit our website to get a free estimate and learn how our certified wildlife management team can not only handle the problem but help secure your home to prevent future intrusions.